This First Look guide introduces you to the InterSystems IRIS™ sharding feature and its use in a sharded cluster to horizontally scale InterSystems IRIS Data Platform™ for data volume. As part of this guide, you will use ICM to provision a sharded cluster in a public cloud and see how sharding a table distributes its rows across the shards in a cluster. How Can Sharding Help You? Are you feeling the Big Data heat? Ready or not, we are all managing more data than ever before and being asked to do more with it  and the response times demanded are growing ever shorter. Whether you care for ten million patients, process billions of financial orders a day, track a galaxy of stars, or monitor a thousand factory engines, your data platform must not only support your current data workload but scale to meet increasing demand while maintaining the performance standards you rely on and avoiding business disruption. Each business-specific workload presents different challenges to the data platform on which it operates  and as workloads grow, those challenges become even more acute. Complex queries that do large amounts of data processing, such as those that scan a lot of data on disk or involve significant compute work. Note that these characteristics all have to do with data; the primary function of InterSystems IRIS sharding is to scale for data volume. But a sharded cluster can also include features that scale for user volume, when workloads involving some or all of these data-related factors also experience a very high query volume from large numbers of users. And sharding can be combined with vertical scaling as well. With InterSystems IRIS, you can create just the right overall scaling solution for your workload’s performance challenges. Queries directed to the shard master are run in parallel on the shard data servers, with the results merged, combined, and returned to the application as full query results by the shard master, significantly enhancing execution speed in many cases. 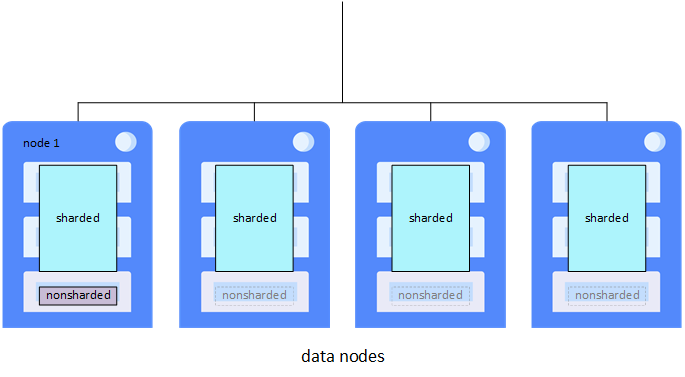 Each shard data server has its own dedicated cache, rather than a single instance’s cache serving the entire data set, which greatly reduces the risk of overflowing the cache and forcing performance-degrading disk reads. Data can be loaded onto the shards in parallel, reducing cache and disk contention between the ingestion workload and the query workload and improving the performance of both. Nonsharded tables are stored on the shard master, while a federated software component called the sharding manager keeps track of which data is on which shard data servers and directs queries accordingly. From the perspective of the application SQL, the distinction between sharded and nonsharded tables is totally transparent. Deploy a basic sharded cluster in a public cloud using InterSystems Cloud Manager (ICM). ICM is an automated command-line tool that makes it easy to provision infrastructure in the cloud and deploy InterSystems IRIS and other services on the provisioned nodes. ICM takes care of all the needed InterSystems IRIS configuration, so if you specify a sharded cluster, the cluster is ready to use when deployment is complete. Create three sharded tables from the same data using different shard keys and observe the different distributions of the rows across the shards. The shard key is the field or fields used to determine which rows of a sharded table are stored on which shards. By default, the RowID is used as the shard key, and this distribution is the most effective approach for most sharded tables because it offers the best guarantee of an even distribution of data and allows the most efficient parallel data loading. There is one case, however, in which a user-defined key can be beneficial. When you shard two large tables that are frequently joined in queries on the field or fields used to join them, the rows to be joined are stored on the same shards, and a join can be executed locally on each shard rather than across the shards, providing a significant performance boost. This is called a cosharded join. Run the same query on all three sharded tables to demonstrate that the distribution of rows across shards is entirely transparent to the query. To introduce you to sharding without bogging you down in details, we’ve kept this simple. A sharded cluster in production requires planning and a number of decisions, so be sure not to confuse this exploration of sharding with the real thing! For example, when designing a production cluster, you would review your schema and tables to decide which tables are to be sharded, then decide how many shard data servers to deploy (typically on the order of 4 to 16) based on both the anticipated working set for the sharded data and the amount of memory available for the database caches on your servers. In this exploration, however, you’ll deploy a basic two-shard cluster. The sources listed at the end of this document will give you a good idea of what’s involved in using sharding in production. The chapter “Horizontally Scaling InterSystems IRIS for Data Volume with Sharding” in the Scalability Guide provides detailed information about sharding and sharded clusters. These instructions assume you have an InterSystems IRIS sharding license and access to InterSystems software downloads. You can find the procedure for using ICM to deploy the sharded cluster on the Amazon Web Services public cloud platform in First Look: InterSystems Cloud Manager; specifically in the section Try It! Deploy InterSystems IRIS in the Cloud with ICM. You can use the entire procedure as it is presented there. When you get to Customize definitions.json, be sure to make the one required change to the definitions.json file  replace the value of the LicenseKey field with the filename of the InterSystems IRIS sharding license that you have placed in the staging location specified by the LicenseDir field in the defaults.json file. When you have finished the deployment stage (Deploy InterSystems IRIS), remain in the ICM container. As an alternative, if you prefer, you can install the InterSystems IRIS instances on existing physical, virtual or cloud machines and deploy the sharded cluster using the Sharding API, as described in Deploy the Cluster Using the Sharding API in the “Horizontally Scaling InterSystems IRIS for Data Volume with Sharding” chapter of the Scalability Guide. Create and populate a small nonsharded table. Create three sharded tables with the same fields as the nonsharded table, using three different shard keys. Populate the sharded tables from the nonsharded table. Select the rows from the sharded tables to see how the rows are distributed differently across the shards in each case. When a table is sharded, RowID values are assigned from different ranges for each shard, starting at widely-separated ranges; rows in the same range are on the same shard. When dealing with a small table, as in this case, the shard RowIDs are easy to distinguish, clearly showing you which rows are on one shard and which on the other (although you cannot tell which shard is which). Rows of tables sharded on RowID are distributed in a way that has no relationship with the data in the rows, and which would likely be different if you emptied and reloaded a table. A user-defined shard key, on the other hand, distributes rows based on the values of the field or fields in the key, and will therefore be the same when you reload the table (assuming the values and the number of shards have not changed). Query all three tables for the maximum length of one of the fields to show that the distribution of rows across shards is transparent to the query. Open a Terminal window on the shard master instance. The icm terminal command opens a Terminal window for the InterSystems IRIS instance on the node you specify, in this case the shard master data server. If you deployed your cluster manually using the Sharding API, open a Terminal window on the shard master instance. In the Terminal window, switch to the cluster’s master namespace. Otherwise, switch to the namespace you specified in defaults.json. If you deployed your cluster manually using the Sharding API, change to the master namespace you created when configuring the shard master data server. Create and populate the nonsharded table, test.nonsharded, with the following SQL statements. Use SELECT *,%ID to display the contents of each sharded table with its RowID on the shard. This distribution does not reflect the values of field1 or field2 (rows with all three values of each are located on both shards). If you delete, recreate, and reload test.rowid, the distribution may be different. Sharding on the field1 field distributes the rows so that those with the same value of field1 are placed on the same shard. In this case, rows with value one are on one shard and those with values two and three on the other, but which values end up on which shard depends on how many shards and how many values there are. Here, distribution is determined by the value of the field2 field. In each case, the result is 5, the length of the longest value, three, because the distribution of rows across the shards is entirely transparent to the query. The MAX(LENGTH(field2)) expression is computed independently on each shard, and the shard master chooses the MAX() of the results they return. For example, when the query is run on the test.field2 table, one shard returns 3, because it has only the value one in the field2 field, while the other shard returns 5; the shard master then chooses 5 as the larger of the two results.